Tingling, pain or numbness in the area of the hand served by the median nerve. Often these sensations first occur while you are sleeping. Many people mistakenly believe this phenomenon occurs because they are sleeping on their hands. Though not everyone with "CTS" has the experience of waking up at night with their hands "on fire," it is probably the best early indicator of a problem even though research has not found a clear explanation for why this symptoms is common. 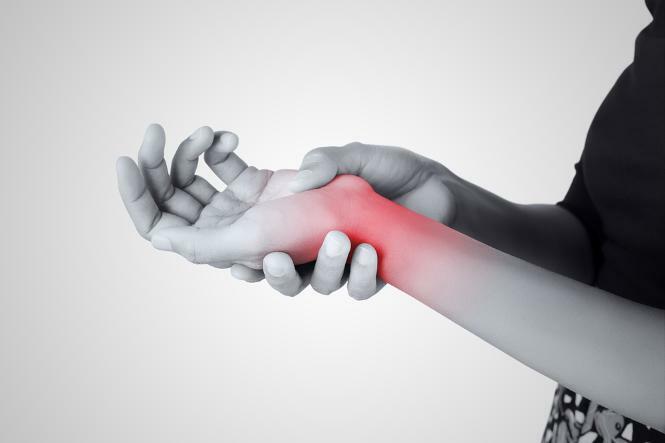 Some people report tingling, pain or numbness that is not limited to the median nerve area but may feel as if it has spread to the entire lower arm from the elbow down. This should indicate simultaneous compression of one or both of the other nerves that provide sensation to the arm and hand (see ulnar nerve entrapment at the elbow, ulnar nerve entrapment at the wrist and thoracic outlet syndrome). When left untreated, the tingling, pain, or numbness can develop into excruciating pain. Loss of muscle tone and strength at the base of the thumb is a sign of advance "CTS". This condition is noticeable when the fleshy area at the base of your thumb atrophied (reduced at size). STEP # 2: Your doctor will review your medical history to determine if you had, in the past or have presently, any of the non-occupational factors associated with "CTS", including arthritis, diabetes, gout, hypothyroidism, menopause, pregnancy, wrist fractures and dislocations. Your doctor will ask you a series of questions regarding your work history. Most questions will focus on your present job. For example, does your job involve repetitive motions, high levels of force, vibrations, etc? How often do you take rest brakes? Is your job stressful, etc? Your medical and work history are important factors in accurately diagnosing "CTS". Unfortunately, many doctors are not aware of the prevalence of Repetitive Stress Injuries and their association with job related risk factors. Others are hesitant to indicate that your Carpal Tunnel Syndrome is related to your work activities, simply because they do not want to get involved with Workers' Compensation insurance companies. Even though you may have a non-occupational "CTS" factor (i.e. diabetes), you are, nevertheless, entitled to receive Workers' Compensation benefits if your work responsibilities aggravated or accelerated such pre-existing conditions. Your doctor's records indicating your symptoms, work activities and your doctor's opinion that your "CTS" is related to your work, is significant legal evidence to establish your right to receive Workers' Compensation benefits. The date that you are informed by a doctor that you have developed work-related "CTS" is the "official" date of accident in Repetitive Stress Injury Workers' Compensation claims. This date is significant to the filing and notice requirements of the Workers' Compensation Act. Phalen's maneuver- Requires you to put the backs of your hands together with your wrists flexed and your fingers pointing toward the ground. Because this forces compression of the median nerve, you will reproduce your symptoms of "CTS" after one minute in this position if you have this disorder. Tinel's sign- A simple test in which you rest your hand, palm side up, and tap on your wrist where the median nerve passes through. If you experience tingling or numbness in the parts of the hand that receive sensations via the median nerve, you have reason to suspect that you have "CTS". (1)Nerve Conduction Velocity Testing- Your nerves conduct electrical signals. NCV testing measures the speed at which the signal travels. A damaged nerve transmits the signal at a slower than normal speed. If the result of your NCV test indicate nerve damage, it is likely that you have a relatively severe case that requires immediate attention and treatment. If your test does not indicate nerve damage, however, this does not put you in the clear. NCV tests have a high threshold-that is, they usually detect nerve damage only when it has progressed significantly. Because NCV tests can cost anywhere from $150 to $500 depending on where you live and the extent of the tests, and because they are of limited use, at best, for detecting nerve damage at early stages, they are used with restraint. Often, self-reporting of symptoms and simple so called provocative tests such as Phalen's test and Tinel's sign are more sensitive, far less expensive and therefore, more practical. (2) Electromyography- EMGs measure the response of muscles to electrical stimuli, just as electrocardiogram (EKG's) measure the responses of heart muscles. You have two kinds of nerves-those that carry sensory signals (allowing you to feel sensations) and those that carry motor signals (that move your muscles.) EMGs are used to test the latter. Even more than NCV tests, EMGs detect only advance nerve damage. They are not generally useful in testing for RSI involving tissue damage. Magnetic Resonance Imaging (MRI), while effective in diagnosing Carpal Tunnel Syndrome, are rarely used due to their considerable expense. IMPORTANT NOTE: As a result of recent advances in digital imaging, high frequency sonography is gaining acceptance as a cost-effective test for diagnosing "CTS". Unlike MRIs, sonography is an examination which can be performed with the wrist placed in different positions.